It was probably a couple of months ago that I went out and bought myself a new bed frame. 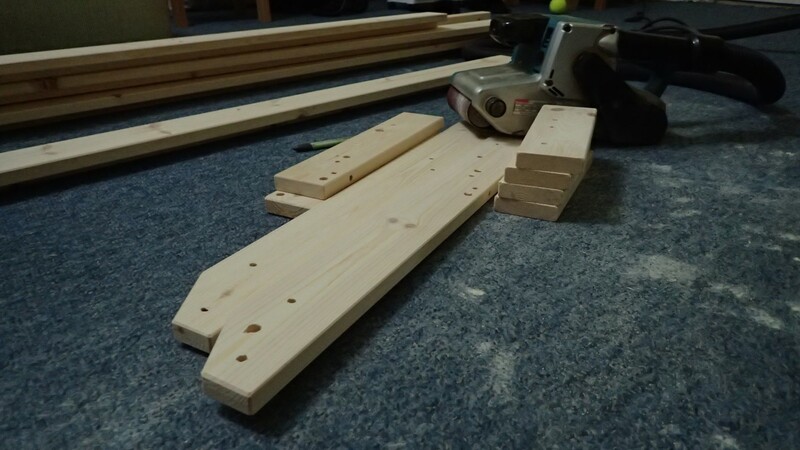 Replacing my old one (which was given to me in 2011 and second-hand at the time) is something I’d been thinking about and, while I had aspirations towards making my own frame, I’m still lacking the facilities and space for doing much in the way of woodworking. 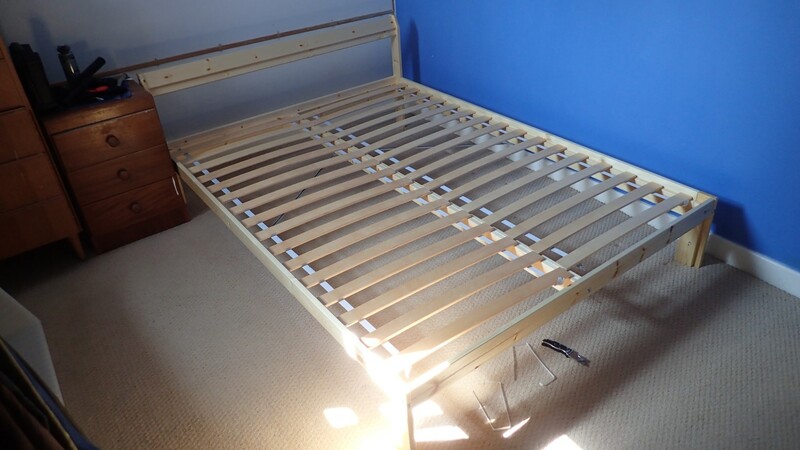 So, it was with another trip to Ikea that I would come away with the Neiden double bed frame. 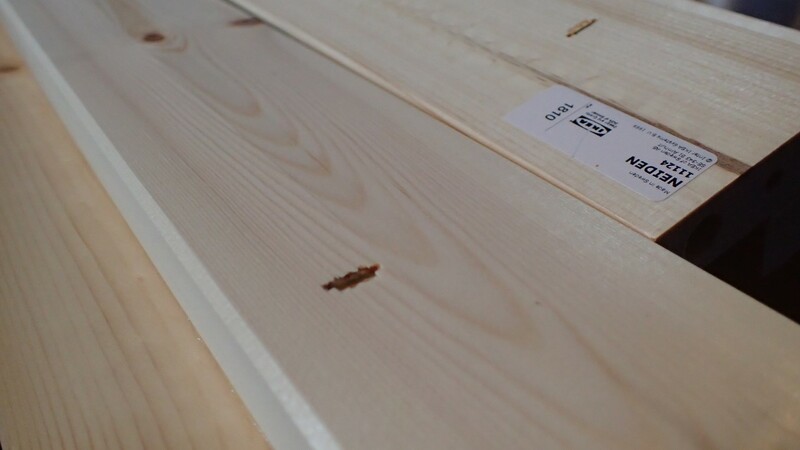 It’s made entirely from pine, came with all the fittings, the slats for the base and, well, it was only £59. I’m sure that the material costs alone would’ve consumed most of that, had I looked to build this model or similar by myself. 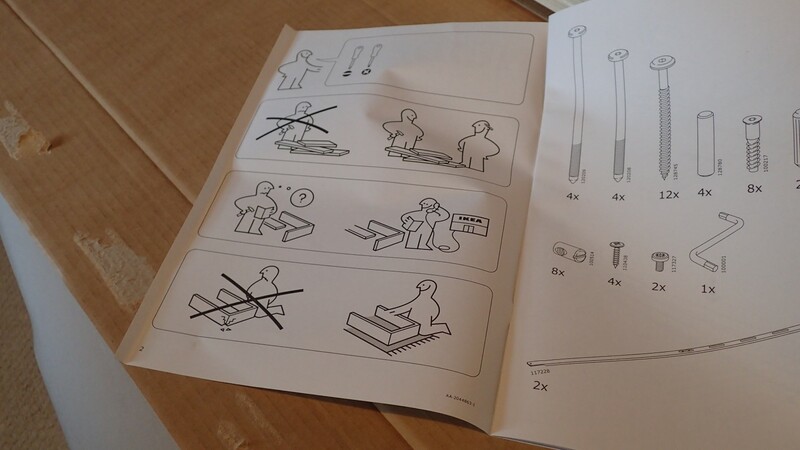 You also get the usual Ikea instructions with that strange formation of a human depicted in each diagram. I was confident that I wouldn’t need to be picking up the phone anytime soon after starting! 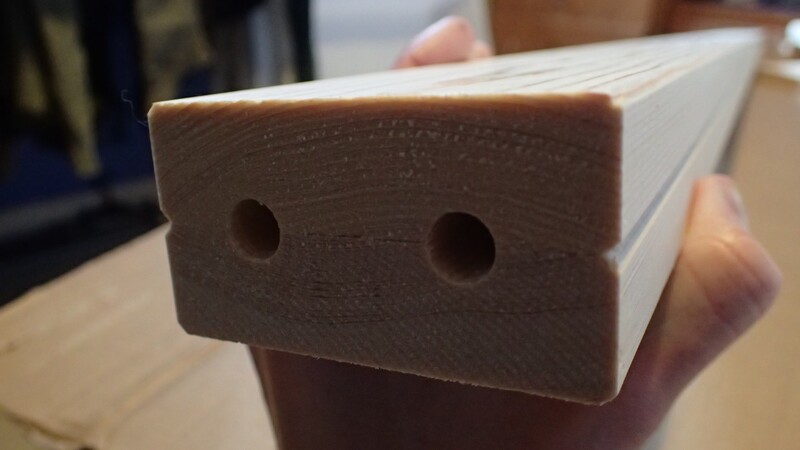 I’ve talked before (if not here then, on my YouTube channel) about my preference for a properly smooth surface on a piece of timber, before I come to apply any kind of finish. These pine boards felt nice under my fingers but I could still see the marks of a rotating cutter block. At least the operative had used a sharp set of knives and a steady feed rate. Honestly, I find that brushing or rolling over any ripples is akin to painting a rough sawn fence panel. It’s hard work, you can waste a lot of liquid and the end result suffers. So, it was out with the belt sander and, with some of these pieces close to 2m in length, I had no choice but to do this on the floor of my living room (carpet is okay at providing friction to stop longer pieces from running away). Of course, I had my vacuum connected at the other end and the whole process took a good amount of time. I think I sanded from 80g to 120g with the belt sander and finished at 180g with my Mirka Handy Sander (not pictured) as I did not have any finer belts. Some of these components have been stapled together in an overlapped fashion, which creates a rebate on either side. You can see, above, how I’ve balanced one over one of the single thickness boards. As the assembly would later continue, I’d be careful to ensure that all staples were facing the inside of the frame, where they would not be seen. Also, Ikea will typically stick labels on to items that are concealed within a box… I found a heat gun worked quite well to remove these, followed by a dose of GooGone for the residue. 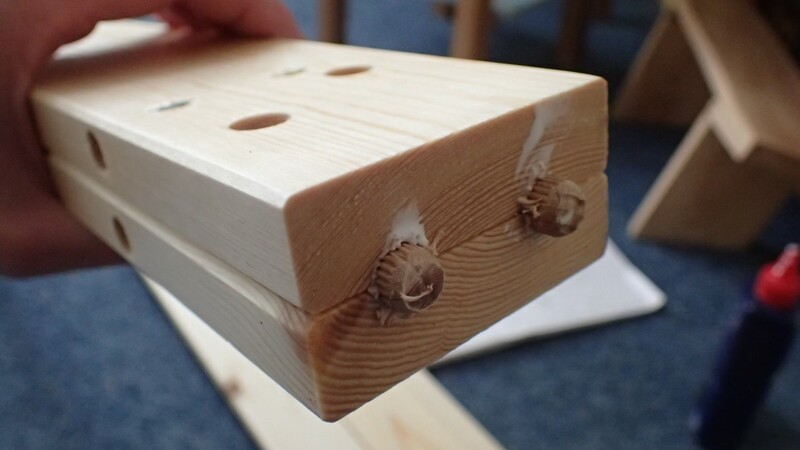 All of the components are pre-drilled, as you would expect from a piece of flat-pack furniture. Doing this accurately without the use of horizontal-boring machinery (again, these are around 2m long) would otherwise be a challenge for most people. One of the most complicated parts of this construction was in my decision to pre-finish the components before assembly… I applied three coats of Liberon Finishing Oil over a number of days; allowing time in between each coat for drying and a light denibbing. I don’t appear to have any photos on hand as this time-consuming process demanded most of the space within my kitchen and I had to leave the windows ajar each night, in order to avoid making myself ill. When all was dry and the time would come for assembly, one of my first steps was to organise the deep mixture of fixings in to containers rescued temporarily from my recycling bin. I find this makes the process of assembly much more efficient, as you can see and reach for what you need, as you require it. 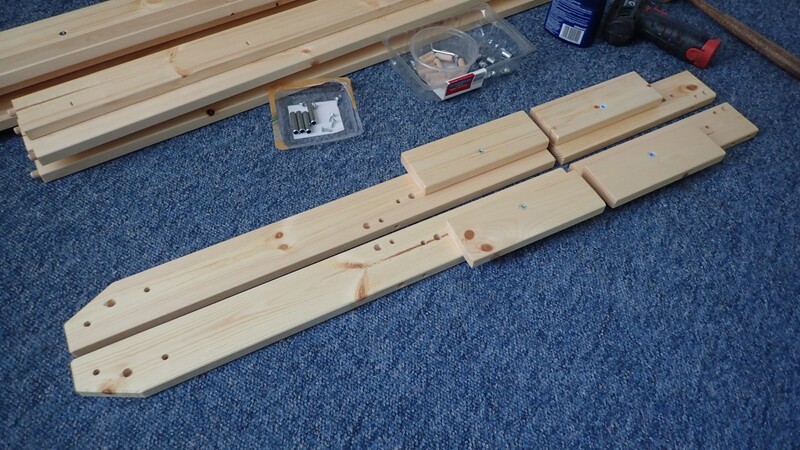 I would continue by knocking 10mm dowels in to the ends of each of the rails. The instructions do not advise you to glue them in place but I decided it wouldn’t hurt, as long as only glued them in as if they would become tenons. Some of the faces would require threaded inserts to be driven in. 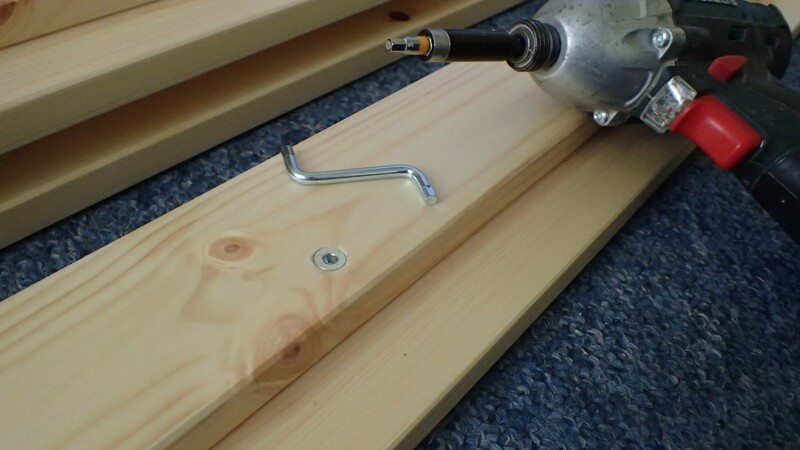 Ikea typically supply The World’s Smallest Allen Key to do this, while I always favour my impact driver. Here, you can see the leg assemblies, with shorter pieces screwed on top and, again, creating a rebate on each side. The longer legs are for the rear of the bed while the shorter ones go at the foot end. 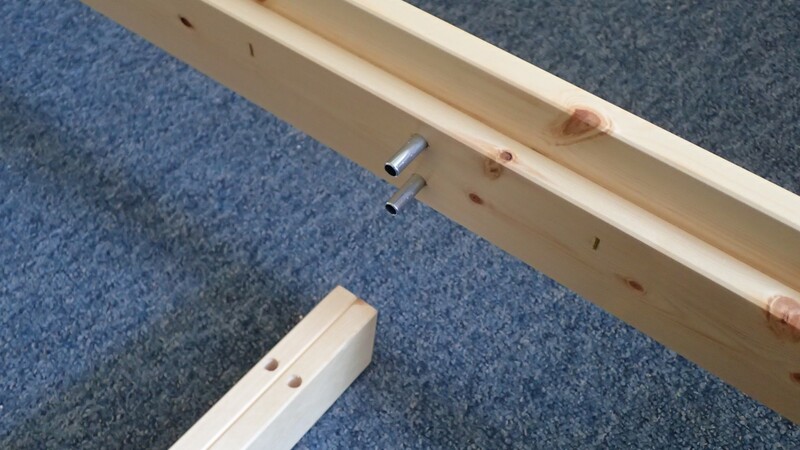 I continued by completing the foot and head end frame assemblies, attaching the corresponding rails. 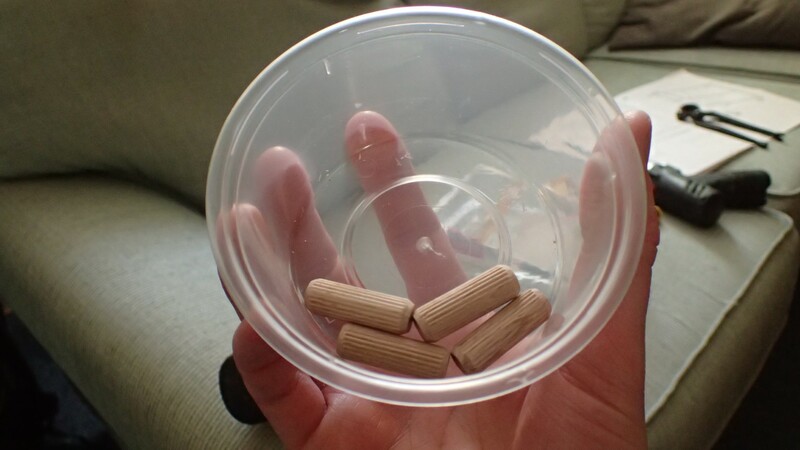 They supply these pan-head coarse-threaded screws – very much like coach screws – that were close to 90mm long, from memory. I do feel for anyone who would endure the suffering of that inferior tool that comes with the kit… This was quite a struggle for my 10.8v impact driver. I think I’d have given up without it! 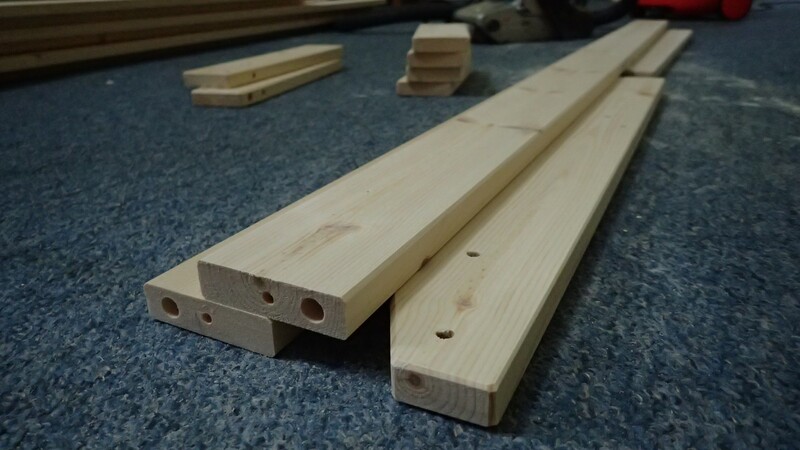 Getting carried away with myself, I got carried away knocking dowels in to the ends of the centre rail, which is evenly double up in thickness. 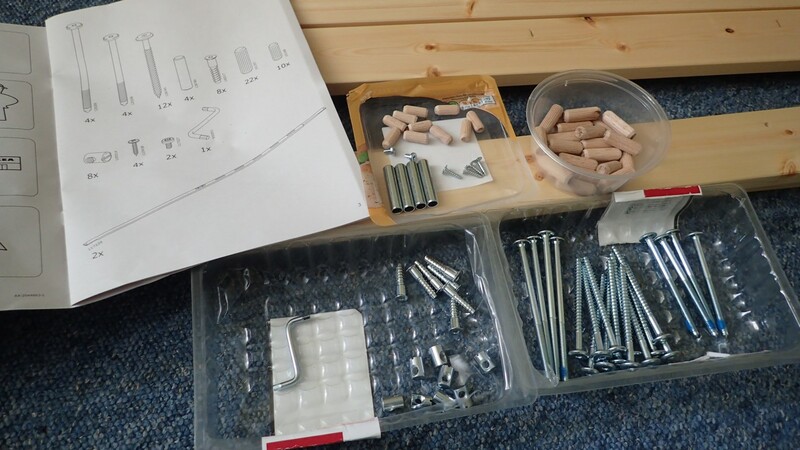 Whatever you may think of Ikea furniture, I think this piece is relatively well designed and makes good economical use of ex. 3x1in timber. 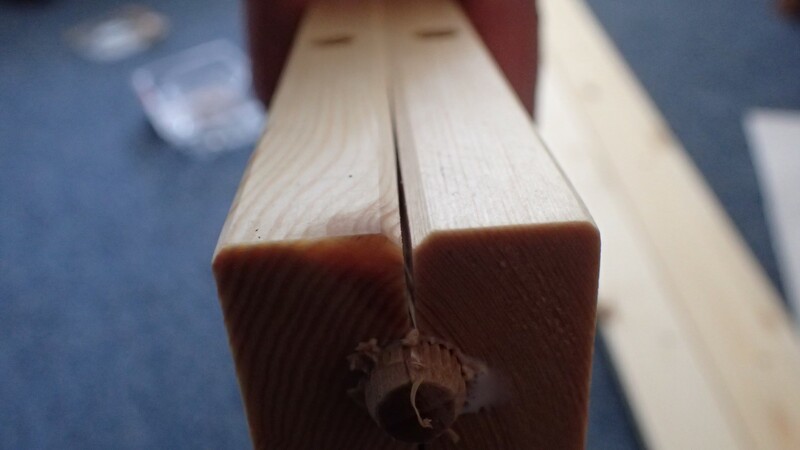 I fought with pliers, pincers and even tried drilling a screw in to the end of each dowel, in an attempt to lever them out… But, as the glue hardened, I knew I would end up having to drill them out! This still left me with four unused dowels, which I can only assume is an error in the packing department. These steel (or aluminium) bushings are the only items that should be inserted, here. 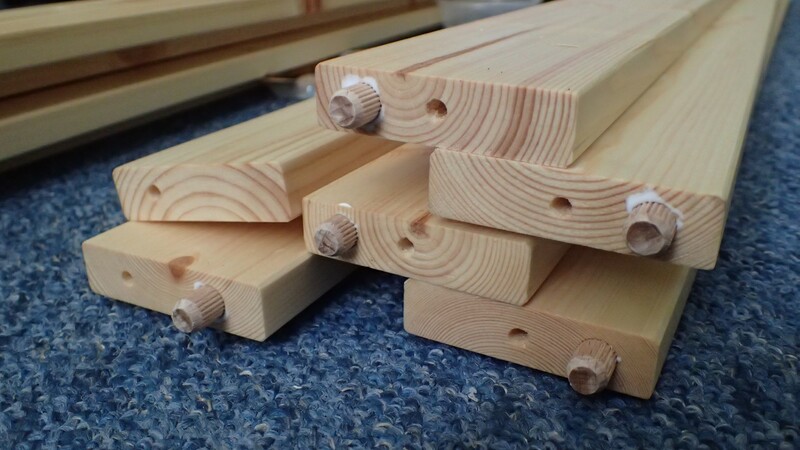 For a knock-down construction, barrel nuts (also known as cross dowels) are used. In the past, I’ve found these can be difficult to source and slightly expensive when you do find them. If, for some reason, I one day send this frame in to someone’s wood burner, I could have most of the hardware with which to build my own bed. With the bed frame assembled, it was time to get my old bed out of the way. As I said; this was given to me in 2011 and its age was unknown at the time. It’s essentially a sprung mattress-base with no storage options and it’s difficult to clean around with the vacuum. I tried giving it away to people on Freecycle and Facebook but they either didn’t turn up or couldn’t confirm their interest. As I write this, it’s in the process of being dismantling ready for a trip to the local recycling centre. Good riddance! Although it does fold in half, it’s an absolute pain to move. I hope that, as a society, we can do away with this form of construction. Especially when a large proportion of the material used will end up in landfill. 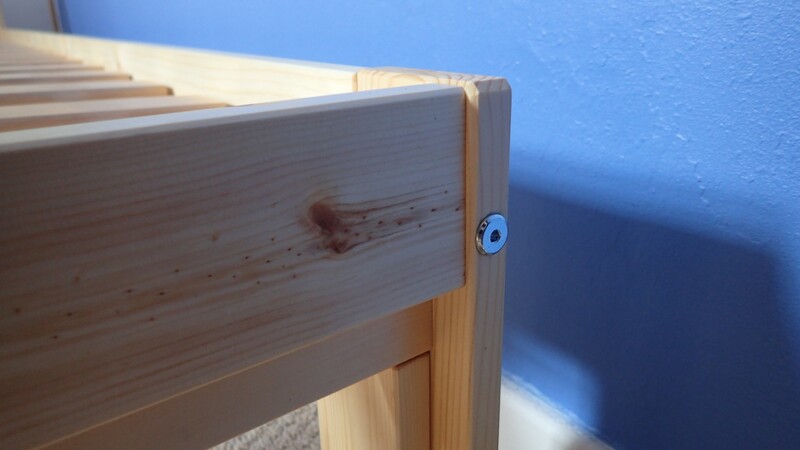 My Neiden Bed Frame comes with the Ikea Bed Slats that I know other furniture makers have used in their own bed designs. You can even buy the frame without the slats, I believe. 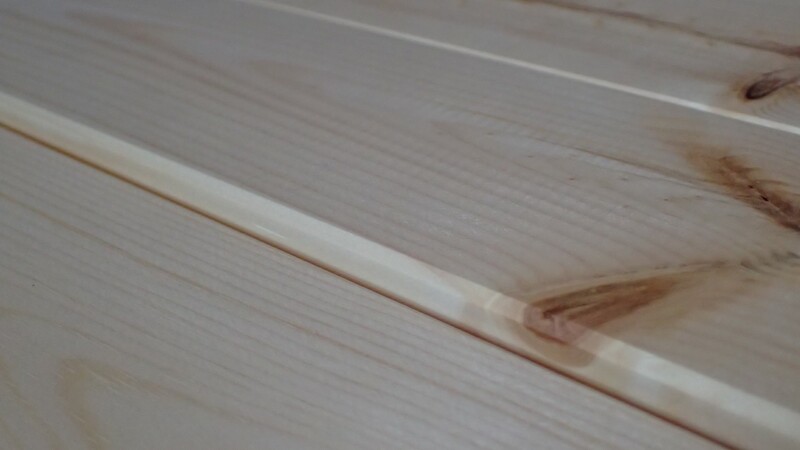 Looking closely, you can see the ‘sprung’ form of each slat. I’m not entirely sure how they do this and I presume these slat just rest in place without being fixed. Instructions are a bit vague, here and I’ve had no trouble with them moving under the mattress. 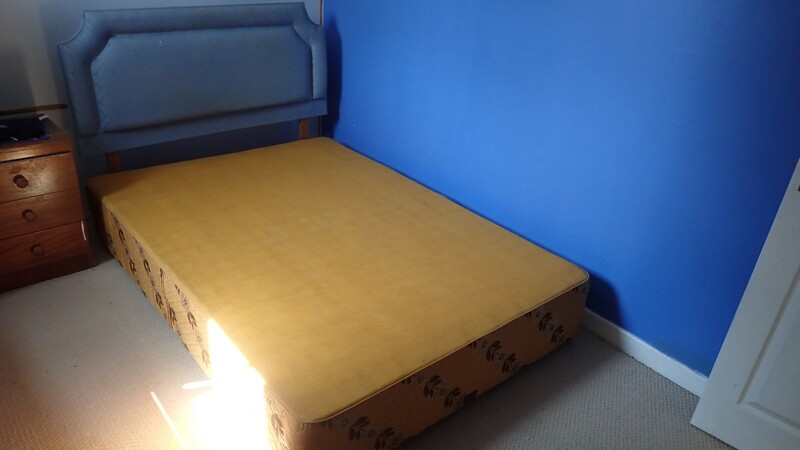 Also absent is the photo of the completed bed with mattress and bedding on top. I’m not a fan of headboards and so, this design suits me well. If I read in bed, I’m typically lying down and not sat at some awkward angle. I wasn’t sure about the idea of these bolt heads being visible but, to be honest with you, I’ve barely noticed them since. 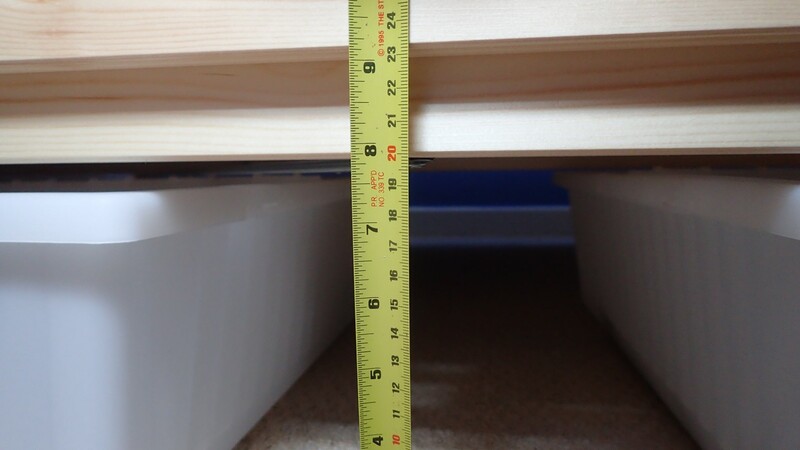 For reference, I measured almost 200mm between my carpet and the underside of the long rails. This should allow for a decent amount of storage although, with my own bed design, I probably would’ve gone for something closer to 300mm. 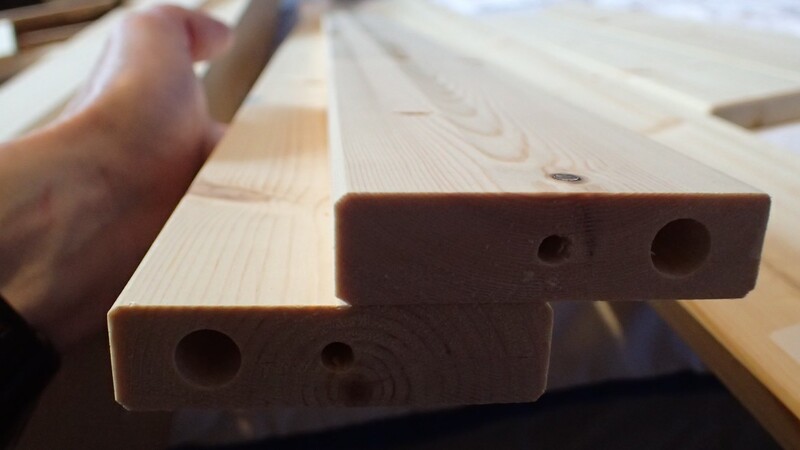 I’d always imagined making my own bed from 75x75mm timber for the uprights and with rails perhaps 150x50mm in section… But this Swedish design, it’s more minimalist and I’m impressed with how sturdy it really is. 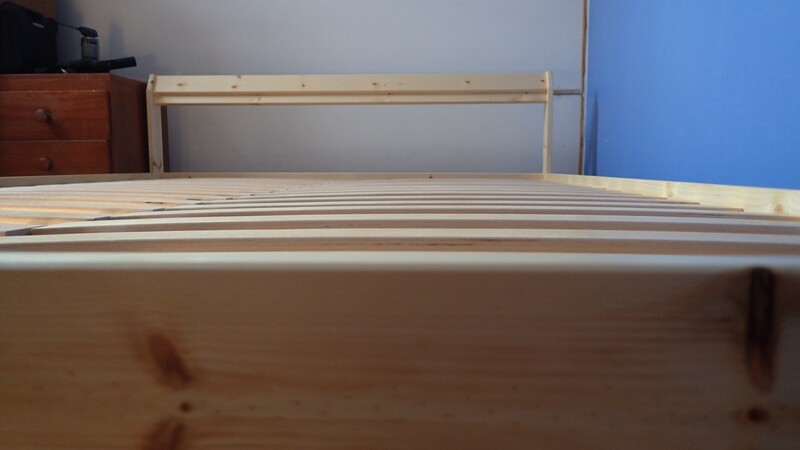 There’s also a metal brace (in a V-formation) that spans the width of the underside of the bed and prevents racking (you’ll see this in the video, when I get around to editing and uploading). 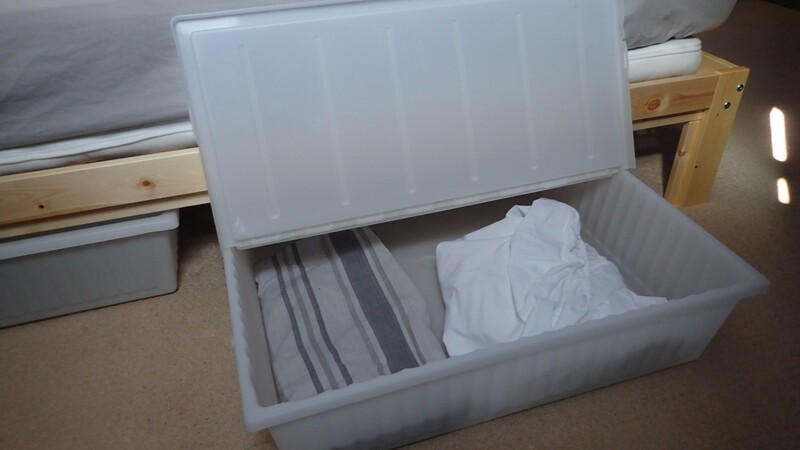 While I was in Ikea, I bought a couple of these Gimse Bed Storage Boxes for my spare sheets, blankets and towels. Items which can be too large for my narrow chest of drawers. I hope you’ve found this useful. I’m very happy with the purchase and feel it offers great value for money while being easy for one person to knock-down, move and reassemble in future. 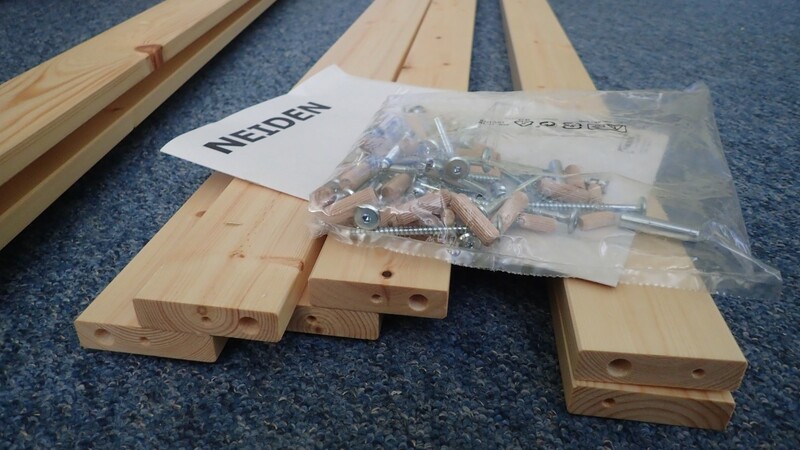 Hi, I am trying to build my Nieden bed frame this week. We got to the middle beam, ie the most important beam, and we are stuck on how to attach it because the 102208 screws seem too short to reach! Any advice? I’m sorry for my delayed response. I’ve been away the past few days. Perhaps you’ve already found a solution to the problem? My first suggestion would be to contact Ikea. I believe they stock spares for most products and, as I’m sure you know, they should be supplied with everything you need and nothing less. 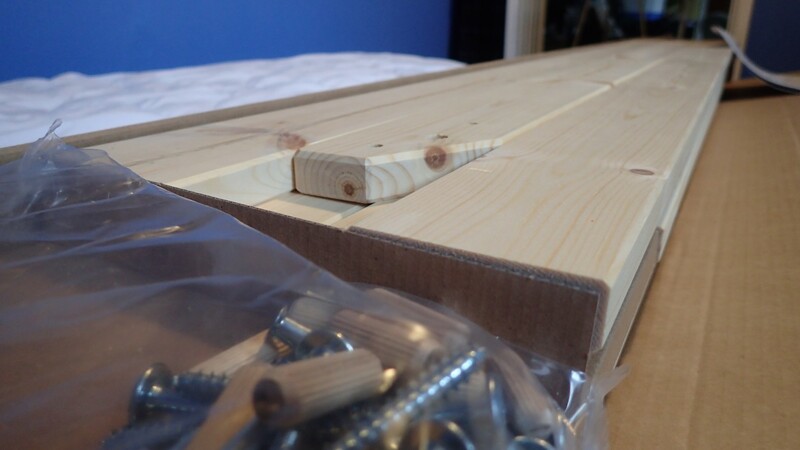 Strangely, I can’t seem to find this bed on Ikea’s UK website any more and I no longer have access to the manual. I’m sorry, I don’t really know what to suggest. It sounds like you may’ve been supplied with the wrong screws. – I understand that you are very particular about having a smooth finish, but if I do not have a belt sander, how long would you say it would take to sand the whole frame manually? And what kind of sanding paper should I get? 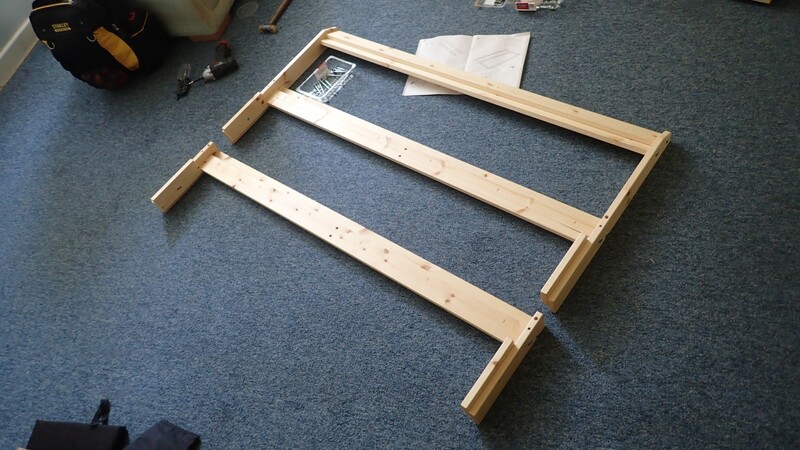 – I intend to paint the frame with a very dark brown colour, what are the steps you suggest before (and after) the actual colour paint? Do I really have to sand the frame and treat the woods? Thanks a lot Olly, hope you have a wonderful week ahead! Hi, thanks for taking the time to read and comment on my post. I don’t think it’s at all necessary to sand the timber. I’m very particular about that sort of thing. I was only looking to remove machining marks that are, truth be told, very unlikely to show up unless you were to place a light source very close to the bed. With regards to painting, I would check the information on the paint tin itself. Some require a coat of primer first; some do not. It all depends on which you choose. I found the finish out of the box felt very smooth and would be fine for painting. I just didn’t think it was good enough for my preferences with a clear finish. 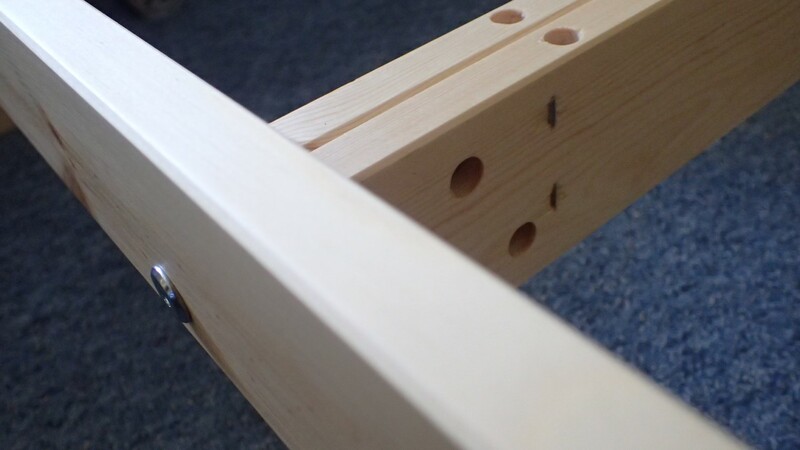 The only visible screws are the ones on each of the four legs, holding the rails in place. They’re a silver colour and would stand out against a dark paint. What you’ve suggested should work fine. A scribbled over the timber so that, as the pencil marks were then removed, I could see which areas had been sanded and which needed more attention. I hope this helps and thanks also for watching my video. Please feel free to share any further questions you may have. Hi Olly, I’ve just watched your fantastic YouTube vid and now found this and wanted to ask if you had any difficulty fitting the bolts into the barrel nuts near the end of the assembly! Do you have any tips for getting these to work? Thank you for watching my video and for finding this post. I didn’t really have any trouble. 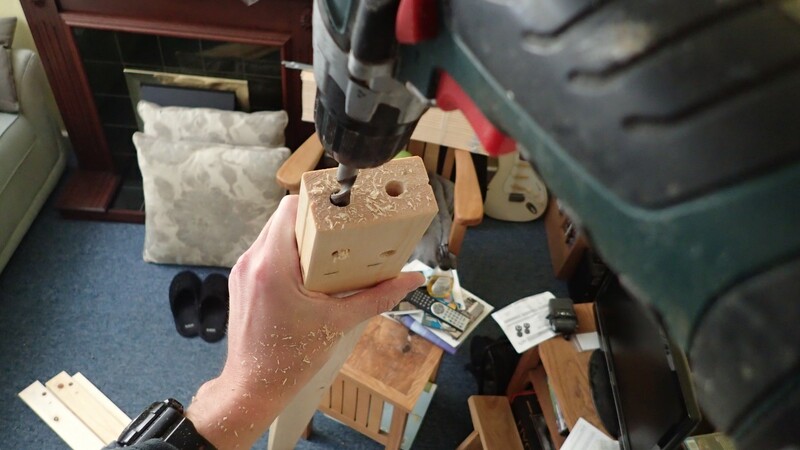 I would double check that you’re putting the nuts in the correct holes – for some reason, I think they drilled other holes that don’t seem to get used. 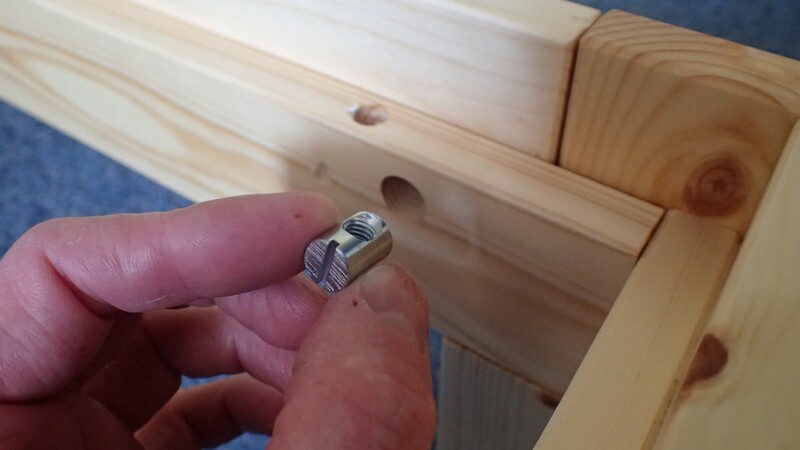 I wonder if you can use something thin – maybe a pencil – and poke that through to help align the nut, before fitting the bolt? I hope this makes sense and helps. Sounds like you’re in a frustrating situation. I’m happy to help further if I can. Thanks for that Olly, we’ve managed through perseverance to build two of the three beds now. 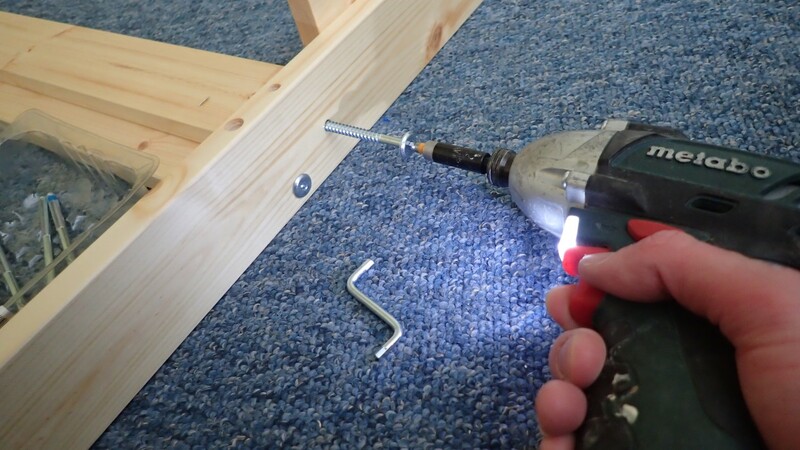 Seems to be just a case of keeping going until they catch, my partner used a drill to screw in the bolts (and the other fittings) after watching the video and found it to be much easier and quicker. Unfortunately we only found the video after struggling with the first bed!! I’m, glad to hear you’ve made it and that you didn’t give up. 🙂 Oh yes, I do feel sorry for people who put up with using the tiny spanners provided. I’m pleased you found the video to be helpful. All the best. Hej Olly, really great tutorial. I was wondering about the sturdiness of the bed. Is it strong enough to withstand normal use, not being too careful then let’s say sitting down on the bench with a bit more weight? I am 70kg guy, but don’t always sit on the things quietly (not jumping). Hi Petras, thanks for your comment. I think this bed is certainly sturdy enough. I sleep alone and, although I’ve not jumped on it, I do stand sometimes, to reach things.